Ricky Simmons shares his story and reminds all that redemption is always possible. 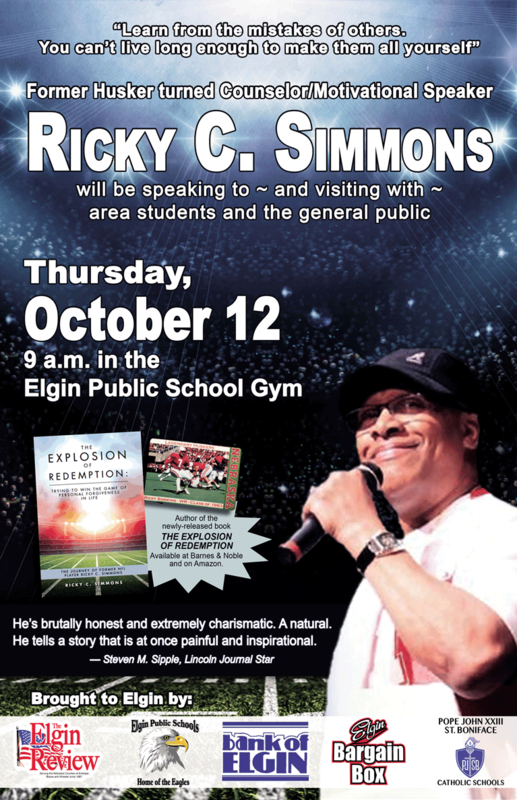 Having been on top of the world, cheered on by thousands as a member of one of the greatest football teams in college history, to hitting rock bottom and being locked in a prison cell, Ricky C. Simmons is now a highly-sought after counselor and motivational speaker who will be bringing his message of hope and redemption to Elgin next week. 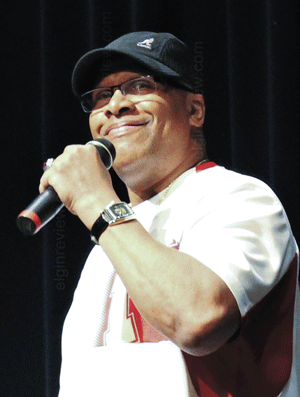 Simmons will speak to students in grades K-12 from Elgin Public, Pope John/St. Boniface and other area schools on Thursday, Oct. 12. Simmons presentation, open to the public, will begin at 9 a.m. in the EPS school gymnasium. Simmons’ appearance is being made possible by donations from Elgin’s schools as well as The Elgin Review, the Bank of Elgin and the Elgin Bargain Box. Born to Bertha and Clyde Simmons in Greenville, Texas, in 1961, Ricky started playing football in the 5th grade as a deal with his father. At the end of high school, his success in football brought him several scholarship offers from all over the country. In 1979, Ricky signed a full-ride scholarship to play for the Nebraska Cornhuskers. Ricky played wide receiver from 1979-1983. After the 1984 Orange Bowl which the Huskers lost 31 to 30 to Miami, Ricky was drafted by the USFL to play for the Washington Federals. The following year, he joined the Orlando Renegades where he played for one year. At the end of the season playing for the Renegades, Ricky was picked up by the NFL’s Atlanta Falcons in 1986. During his first season with the Falcons, he quit the NFL to be a full-time drug addict, which led him to prison. The teachings from his parents had always remained with him, but for the first time in his life he was starting to understand their meaning. From that day on, Ricky started to live a new life driven by a simple and basic concept; take responsibility for your actions. He realized that he does have control of his life, and that he does have a purpose, but it has to start with him. Unlike prior incarcerations, he used this time to become the man that his family, and his mentor Coach Osborne, knew he could be. Leaving prison in 2009, Ricky had a plan and a completely different mindset. Upon his release from prison, Ricky was aware that many doors were going to be shut in his face. Instead of letting it discourage him, he used it as motivation to continue working on his plan. The plan that he developed while incarcerated was to become a drug and alcohol counselor and a motivational speaker. The first thing he did upon his release was meet with his parole officer and he told his officer the plan. He started school to pursue his license and volunteered to work with youth. At this point, Ricky began to work on the second part of his plan, which was to become a motivational speaker. Throughout this period, Ricky faithfully visited Coach Osborne once a week. With the blessing of Coach Osborne, Ricky began to reach out to different agencies sharing his story in the hope of helping others. Facilities such as Boys Town, Geneva, Work Ethic Camp, and Hastings Regional Center began to invite Ricky as a guest speaker, which led to more speaking contracts. Opportunities as a motivational speaker came to Ricky at the end of 2010 to the present. Also in 2010, Ricky received his Provisional Alcohol and Drug Counselor license. His plan is now in full effect. As a footnote, Ricky returned to the prison from which he was released 11 months later. This time, not as a repeat offender, but as a licensed drug and alcohol counselor and guest speaker. Legendary Coach Tom Osborne helped turn Simmons’ life around. “Ricky Simmons, a starting wide receiver in 1982 and 1983, has become an informal mentee of mine in recent years. Although he came from an excellent family, he struggled with drug addiction and spent several years in prison. During his last stay in jail, I wrote him a simple letter letting him know I still believed in him. “Even though the letter was brief, it apparently arrived at a critical time in Ricky’s life. He had lost hope that his situation would ever improve. He says that when he received my note he got down on his knees and made a spiritual commitment which was life-changing. Simmons’ presentation is free and open to the public.